This entry was posted on September 29, 2014 at 6:20 am and is filed under 2014-2015 school year with tags comics, dystopia, education, journal comics, teacher comics, the hunger games, twilight, utopia. You can follow any responses to this entry through the RSS 2.0 feed. You can leave a response, or trackback from your own site. I’ve been thinking that too: this generation feels like the world is ending. Maybe it has to do with feeling separate from the natural world — they may be connected to devices, but not necessarily to each other or something bigger. The disconnection leaves them floating freely in the blackness — a fetus without a cord. Disturbing, but I see that in some of my students faces and actions. That’s a really good and deep point you make… and it’s especially relevant in urban districts, I think. 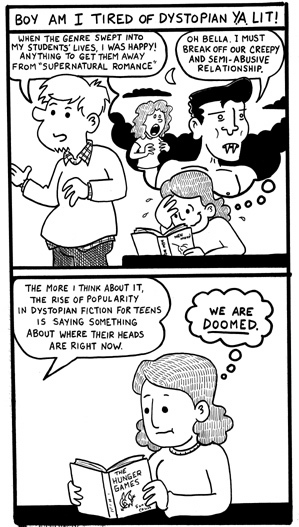 I was pretty interested in dystopia/end of the world style literature when I was a kid though (The Stand by Stephen King was a favorite of mine) so I also think there’s something about the unfairness inherent in these genres that appeals to teenagers who, most of the time, feel pretty powerless. Also, I should say… I had been planning on doing a few more comics themed around this idea, but unfortunately time marched on and I never got the chance. Hopefully I can revisit this sometime in the future.